Yipee! It’s from the Piedmont region in Italy, and costs less than $20. For me Barbera is the Holy Grail of red wine. I love the down-to-earth feeling, and the un-mistakenly Italian frankness and joyful energy. For me it is not so much a flavor experience but a soulful one – nourishing me and lifting my spirits like no other wine. Drinking Barbera makes me happy to be alive. What more can I say? Except to tell you about the wine below, and why I think it’s the best Barbera in the world. The Viberti family run a small, delightful country restaurant called Buon Padre, in the heart of Italy’s famed Barolo region. Third generation son Claudio carries on the tradition of local hostellerie – selling wine and groceries. From the outside everything looks old-world cozy, but once you taste the wines, you’ll realize that Claudio is on the cutting edge of winemaking in this region. One of his projects was to plant a high-density vineyard to produce a more concentrated, less tart Barbera – and to name the wine in honour of his mother Maria, the cook of 50 years at Buon Padre restaurant (and a Barbera fan who is a twin, hence La Gemella). The first time I experienced La Gemella was at a pre-dinner tasting at Buon Padre where it was poured in the company of big-hitting Viberti Barolos. Every wine was a star, but for me Barbera stole the show, and it keeps doing it each year when Kato and I return to Buon Padre with our Italy tour group. I’m sure you can imagine my excitement when I learned La Gemella was coming to the LCBO – for you to experience, and possibly share my love of this wine. A tremendous value. Go to http://www.lcbo.com/lcbo/search?searchTerm=viberti+la+gemella and find your closest store with this wine. P.S. 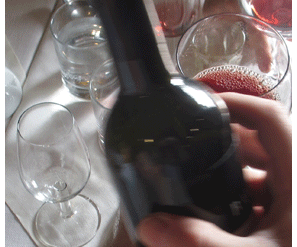 Your bottle(s) will have a little sediment – meaning the wine was not overly filtered, stripping it of character, and bacteria that aids digestion. Speaking of Italy, due to a great response we decided to add ANOTHER TOUR TO ITALY in 2020. 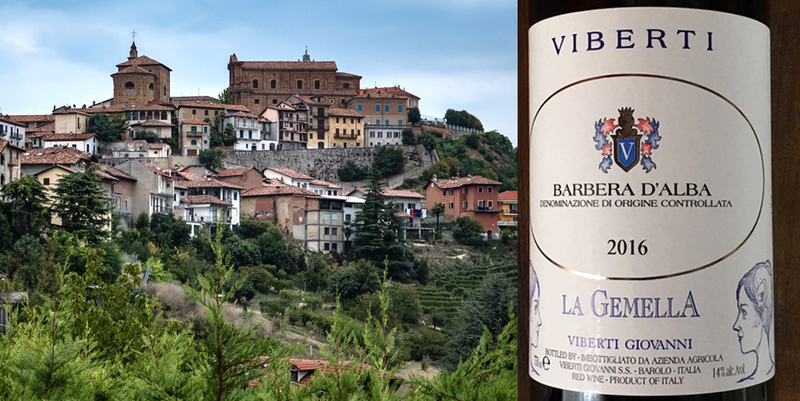 Join us and taste Viberti’s Barbera (and a slew of other Barberas and Barolos)! It’s a beautiful part of the world, and a wonderful opportunity to taste incredible wines. Our revamped website is done!